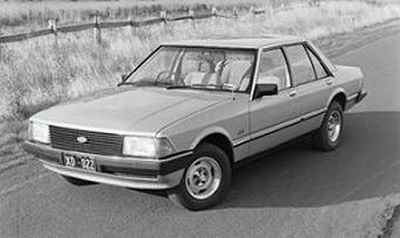 The XD Falcon marked the start of Ford’s determined push to become market leader in Australia, a goal they ultimately achieved, but one that at the release of the XD was beyond their grasp. The perceived fault lay in the size of the XD in comparison with its competitors. While downsized slightly from the previous model, it was still a big car, but, in styling, it made the shift from copying U.S. style to a more sharp edged European look. 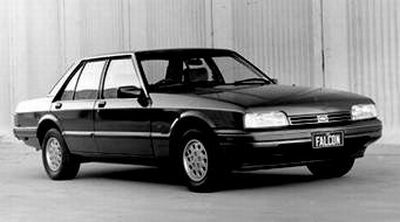 To U.K. eyes, it looks like a MkII Granada, but it was bigger to allow the use of the existing six and eight cylinder engines, while underneath, traditional leaf springs supported the rear axle and the car possessed all the virtues of tough, uncomplicated robustness, much appreciated in its homeland. The XD was manufactured between March, 1979 and March, 1982. 197,293 were produced. The XE celebrated a defining point for Ford Australia as they finally passed GMH in the sales wars, and with a product that they least expected, the Falcon. With its revised front end design, utilising a wrapover bonnet that presaged the demise of the traditional grille in the future, the car was a mild re-style of its predecessor. Mechanically things changed and the leaf springs disappeared forever, replaced by a four link system and coil springs. Gone too, in November, 1982, was the V8. After an unbroken run of 16 years in the Falcon, it had been decided that in the fuel efficient times, the big V was just too politically incorrect. The irony was that the Falcon’s sales success was due to buyers rediscovering their love for big cars. The XE was manufactured between March, 1982 and October, 1984. 191,209 were produced. The XF represented the last of the fourth generation cars, and featured softer, more rounded styling with revsions to the grille and bumpers, and new tail lamps. The fuel injected six cylinder engine, introduced in the previous model to replace the V8 received new management systems, and midway through the production run were modified further to allow the use of unleaded fuel. 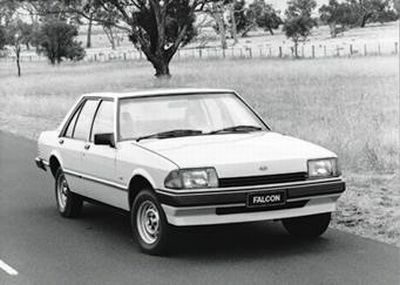 September, 1985 saw the release of the special 25th Anniversary Falcon, featuring a choice of three colour schemes and unique badging and interior. 2000 were sold. Ford did have something to celebrate. The XF was manufactured between October, 1984 and March, 1988. 220,059 were produced.